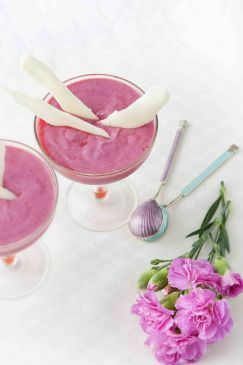 This fresh raspberry mousse is easy to prepare and is a great guilt-free dessert. This fresh raspberry mousse is easy to prepare and is a great guilt-free dessert. Combine all the ingredients and blend. Divide the mixture between four dessert dishes and chill for up to 2 hours. Garnish with reserved raspberries and serve. Hint: Can use frozen raspberries, allow to thaw and drain before processing. Recipe submitted by SparkPeople user GUEST_CHEF.